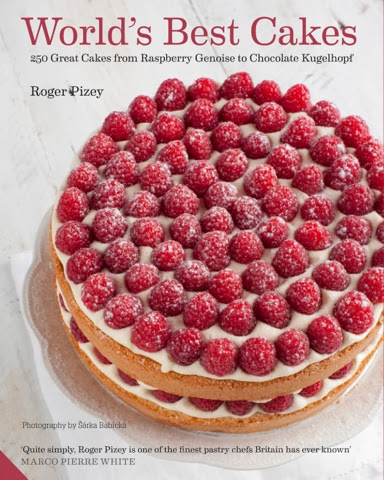 Roger Pizey's brand new baking book is up for grabs in this latest giveaway. With over two hundred and fifty mouthwatering recipes 'World's Best Cakes' is a must for any baker's bookshelves. It contains a fabulous collection of globally-inspired classic bakes, from national favourites such as American Boston cream pie and British Chelsea buns to exquisite small treats including Russian Tea Cakes and French madeleines. Each recipe has been meticulously researched and perfectly baked by Roger Pizey, one of the world's leading pastry chefs. Oh yes please Kate, this is just the sort of book I've been on the look out for - different cakes from around the world. Now the last cake I ate? Hmmm, oh, I know it was a Liskeardy Cake - recipe to appear on my blog sometime this month. A slice of apple and hazelnut cake, made by my friend Pauline. It was delicious. This book looks delicious, too. The last cake I ate was a date custard cake when we went away last weekend - it was so so good. Would love to win a copy of this book! My teenage niece living in the UK has just discovered baking as a pastime - this looks a perfect book for her to keep her interested. Last cake I ate was on Sunday at my mother-in-laws birthday a cream filled laming ton. Lovely. The last cake I ate was an apple and marmalade cake, made to a Nigel Slater recipe. The last cake I ate was a maple syrup and dark chocolate layer cake on the 10th of this month, as it was my mother's birthday. It was a chocolate cake when I visited my friend and their new baby. the last cake i ate was a devils food cake. I made it for my mother in law's birthday.. The last cake I ate was one I baked from scratch; a Martha Stewart Classic Yellow cake with dark Chocolate icing. My son's birthday cake on Monday. This looks like a great book! The last cake I ate was a sticky toffee pecan pie - I just love a good toffee nut combination! The last cake I ate was an ice cream cake from Carvel! This looks fabulous! The last cake I ate was a slice of Maltesers cake last night at a public lecture at my uni. I know how geeky that sounds! This looks like a brilliant book! My manager bought in some peanut butter and chocolate chip brownies yesterday, they were incredible!